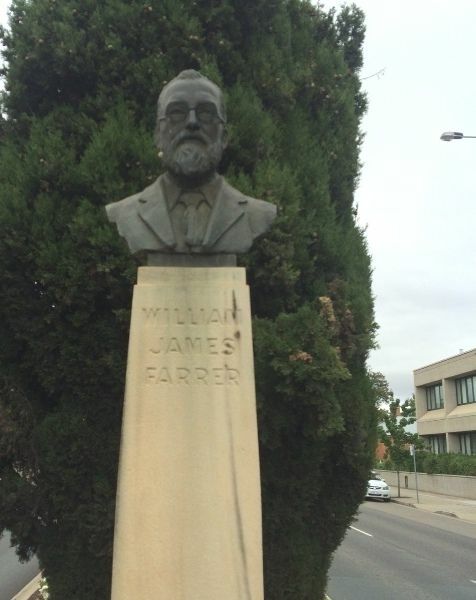 A memorial bust commemorates Australia`s world famed wheat breeder, William James Farrer. The four plaques on either side of the sculpture were unveiled during the Queanbeyan Centenary Celebrations in 1938. During 1995-96 the Queanbeyan City Council discussed the removal of the memorial so as to make way for a right hand turning lane in Monaro Steet. It was agreed to move the memorial further back on the median strip of Farrer Place. A plaque was unveiled at the base of the memorial in 2006 to recognise William Farrer`s contribution as a surveyor. William James Farrer (1845-1906) was born in England and arrived in Australia in 1870. He is world famous for his wheat research as he developed a rust resistant strain of wheat. This was extremely important for Australia and enabled her to emerge as a dominant supplier in world wheat production. Farrer and his family lived in the Queanbeyan district. A memorial bust of Mr. William James Farrer, whose work in producing drought and rust resisting types of wheat made him world-famous, was unveiled at Queanbeyan by the Governor of New South Wales (Sir Alexander Hore-Ruthven) . Mr. Farrer's old property, Lambrigg, where his grave is, is in the Federal Capital Territory, a few miles from Queanbeyan, which is in New South Wales. 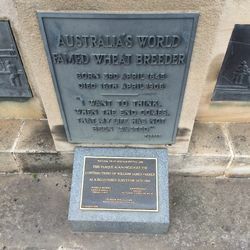 Sir Alexander Hore-Ruthven, who sat during the ceremony on an armchair which had been used by Mr. Farrer, said that Farrer had been a man of vision, who had seen the tremendous opportunities of wheatgrowing in Australia. It was impossible to assess the value of Mr. Farrer 's work in money, but it was safe to say that it had been worth many millions of pounds. Mr Farrer had sought no personal glory, and, no pecuniary reward. He had sought only the welfare of Australia and the wheat industry. Albury Banner and Wodonga Express (NSW), 14 June 1935. Children's Day, which was attended by children from all district schools and from Canberra, was a spectacular feature of the Queanbeyan centenary celebrations. The children executed "folk and Maypole" dances, gave a demonstration of flag drill, and formed the outlines "Q.B.N. 100" in a tableau. The Minister for Education (Mr. Drummond) officially opened the programme. The ceremony of unveiling the four plaques of the William Farrer Memorial was performed by Miss C de Salis, a relative of Farrer. Other members of the de Salis family were also present. Daily Advertiser (Wagga Wagga, NSW), 11 October 1938.